Through The Ages was quite the hit last year with our group of friends. As a deep and complex civ-building game, it may be the best. But it's also a dry, EXTREMELY long game with tons of accounting and ridiculous amounts of downtime while you wait for other people to take their turns. Which is probably why most of us now just play the online email version of the game - all the accounting is done for you and you can take as long as you need to figure out your turn. 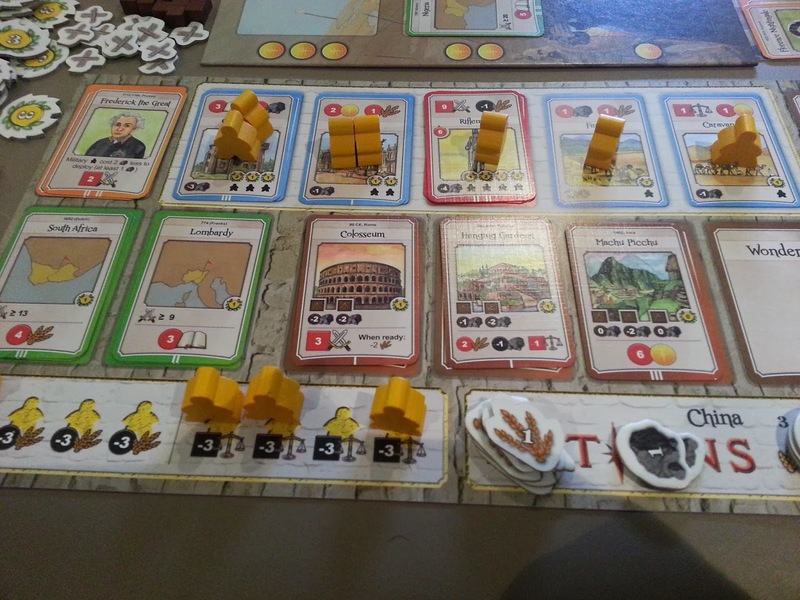 Last night I was able to join in a 3-player game of Nations, a new civ game which many have likened to a quicker, simpler Through The Ages. 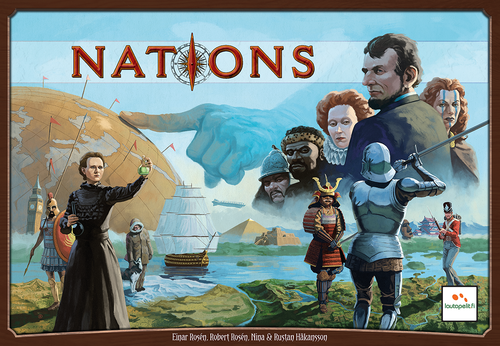 And the description is apt, although I would argue Nations is a different enough game to stand on its own merits. 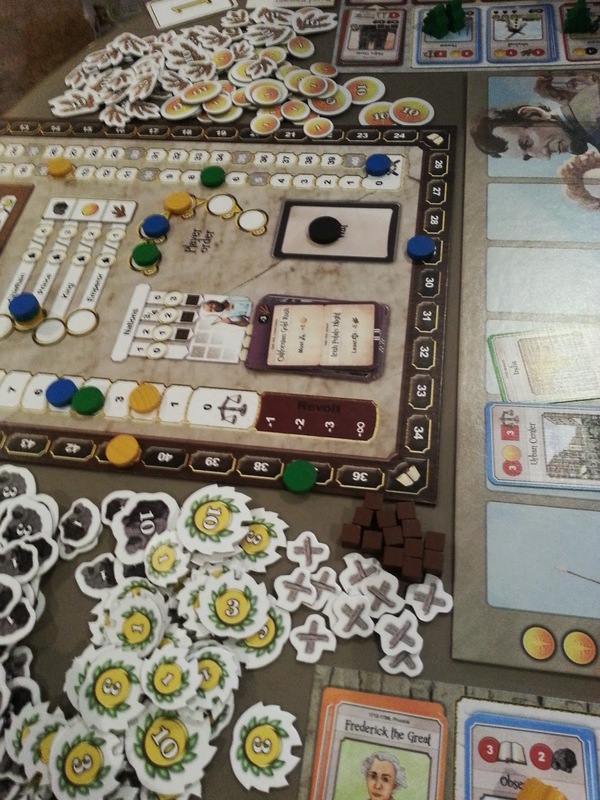 It definitely feels different in terms of play as the rules are much simpler and the play is way more dynamic and interesting since players take one action at a time and then the next player gets to go. 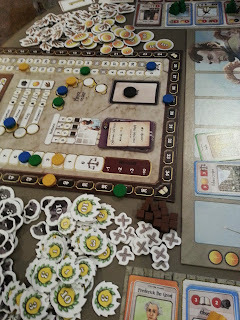 Rarely was I stewing for more than a couple seconds on my choices and I still felt very involved throughout the duration and managed to win handily. But what really stuck out with me about Nations compared to TTA had to do with the military aspects of both games. In TTA, one of the positives and also one of the negatives are the wars that people can launch against each other. They are a necessary and important part of the design to keep play balance and stop runaway leaders but they can also serve to pretty much eliminate someone in hour 4 of 5. In Nations, there are wars and they can definitely damage opponents but they'll never knock you out completely and you can very easily mitigate the risk yourself, at a cost. It's cleverly done and removes the brutality of a nasty game of TTA. I've only had one play so far but I can see very easily Nations replacing Through The Ages, mainly thanks to game length (under 3 hours with rules last night) and teachability. Okay, it has a bit more randomness and it's not as nasty, but it's more interactive and I'd say a more enjoyable experience.... except when the can of Coke spilled all over the event cards! My favourite type of review to read is one that is glowingly positive about a game that I've ordered and is set to arrive any day now . . .